*All First Aid/CPR/AED classes come with an certificate. This course covers the basics of First Aid/CPR. Learn the life saving and accident severity reduction techniques. 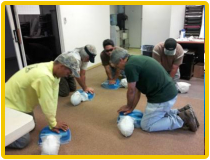 This course covers all facets of First Aid/CPR with hands on instruction of the use of an AED. In addition to learning the life saving and accident severity reduction techniques of First Aid and CPR, the attendees will learn when, when not to and how to utilize the life saving help of an AED. Focusing on First Aid and CPR and its place at the workplace or at the Jobsite, this course offers a comprehensive look at First Aid/CPR (also with hands on instruction of the use of an AED). In this course the types of injuries typical to worksites and jobsites will be explored and hands on practice of treating such injuries will be conducted. In addition to learning the life saving and accident severity reduction techniques of First Aid and CPR, the attendees will also learn when, when not to and how to utilize the life saving help of an AED. Be prepared to handle injuries at your workplace or jobsite. Serving the Hawaiian Islands, Guam, and American Samoa. Philippines. Serving Texas, Arkansas, Louisiana, New Mexico, Oklahoma, Puerto Rico and The U.S. Virgin Islands. Central and South Americas. Alabama, Alaska, Arizona, Arkansas, California, Colorado, Connecticut, Delaware, Florida, Georgia, Hawaii, Idaho, Illinois, Indiana, Iowa, Kansas, Kentucky, Louisiana, Maine, Maryland, Massachusetts, Michigan, Minnesota, Mississippi, Missouri, Montana, Nebraska, Nevada, New Hampshire, New Jersey, New Mexico, New York, North Carolina, North Dakota, Ohio, Oklahoma, Oregon, Pennsylvania, Rhode Island, South Carolina, South Dakota, Tennessee, Texas, Utah, Vermont, Virginia, Washington, West Virginia, Wisconsin, Wyoming. Guam, Puerto Rico, U.S. Virgin Islands. Brazil, Canada, China, Germany, Japan, Mexico, Philippines, United Kingdom.